With so many mobile devices in the market, more and more apps being developed. It kind of reminded me of the early day of the web when new browser came up one by one. In the mobile world, we have to deal with different devices and choose between web or native app. 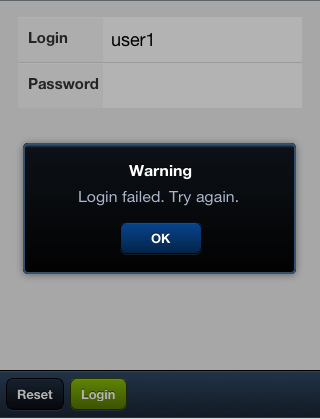 With HTML 5, our web app can do some of the things that a native app can. If you are familar with Sench Touch, the framework provides features such as touch event, geo location, offline storage and rich UI library. So, what are the things that may driver us to go native? at the top of the list is accessing the devices features & hardware (e.g. accelerometer, photo, contacts, vibration, etc). The 2nd driver could be $, meaning selling our apps in the App Store. package your web app code and resources into a binary app and deploy to multiple platforms (currently it supports 6 platforms; iOS, Android, Windows Phone 7 (coming soon), Blackberry, Palm/HP webOS and Symbian. access native features such as accelerometer, camera, compass, contacts, file, geo location, storage, meaid and notification. The features x devices/OS matrix is available here. Interestingly, You can also compile your code in the cloud via build.phonegap.com. It is still in beta, so it is free. The pricing details will be announced near its launch date. For now, building graphic intensive apps may not be suitable. Coding in the device native language may be better. But with the advancement in HTML 5, things may change. The first stable release (v0.6.0) of PhoneGap was in Feb 2009 and now it is at version 0.9.4. Will there be big changes before it reaches 1.0? 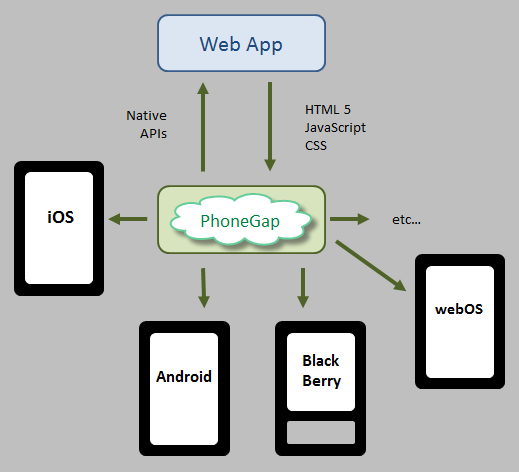 Using PhoneGap means you must keep up with the devices OS version & PhoneGap. Hopefully the release can be fast enough since it is supporting so many devices. For iOS, the framework integrate with XCode and it is very easy to jump start. The documentation is good. It is organised base on the features and each has example. Below is the PhoneGap presentation at Sencha Con 2010 and more presentations here. I downloaded and started to play with the framework a little. 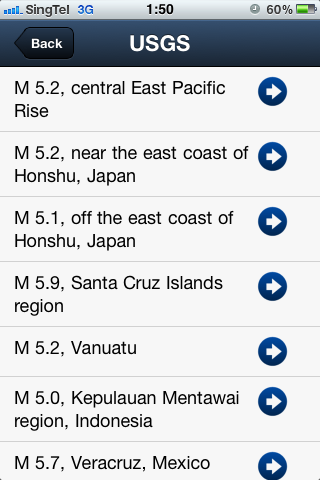 I migrated my USGS app – which is based on Sencha Touch – to a native iPhone app. I have yet to explore its native APIs in depth. Just wanted to share the framework. In my previous post, I shared presentation on Sencha Touch MVC. That’s all the “talk”, it is time to see it in action. This short tutorial will walk through the implementation of Sencha Touch MVC application. 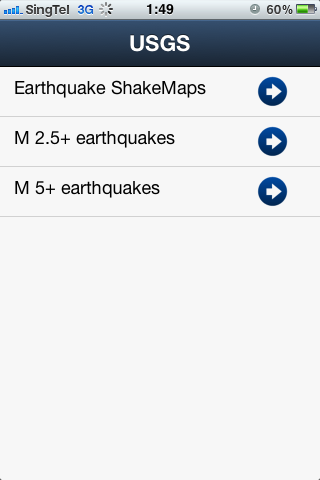 I revamped my old (and long forgotten & messy) USGS apps as example. Before I dive into the code, I will share how to structure the apps. Firstly, create the folder structure to support the MVC application. The figure below shows the basic structure required and the codes are available here. I personally think this is a good practice and can be use as coding standard and guideline for Sencha Touch apps. In addition to that, you may want to standardize the file & object naming convention for the controllers, views and data models. app – folder for your sencha touch code, containing app.js and folders for controllers, models and views. resources – folder for web resources such as css & images. index.html – the main page to launch the apps. Create app/app.js and add the basic launcher for an Ext.Application instance. 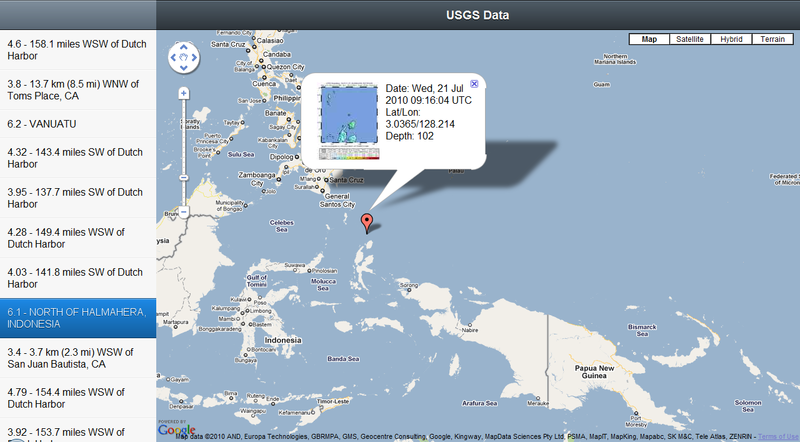 In the example it will be namespaced as “usgs”. 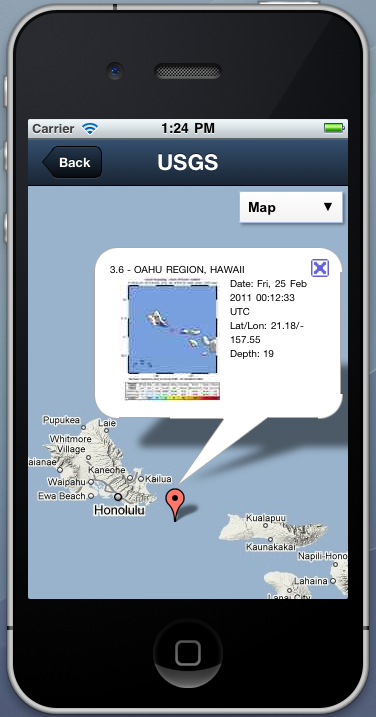 Create a main Viewport view which will house the pages required for displaying USGS Earthquake data. Here we place references to the card instances in the “usgs.views” namespace, so that we can refer to them explicitly in our page flow. Like any MVC-based application the next step is to prepare for the data model. In the models folder, create a definition of the USGS model. The data structure match the content structure is USGS website. 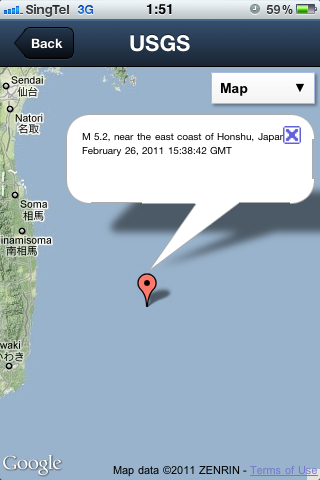 In order to demonstrate the use of JSON, I used YQL to convert the RSS data from USGS. 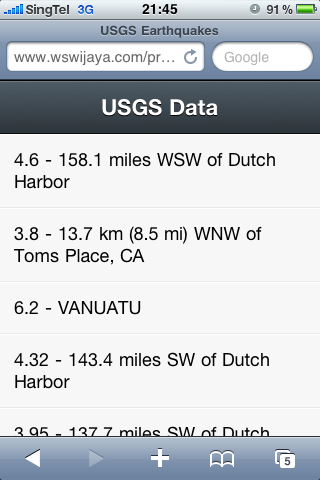 USGS List – based on the selected menu, this view shows the list of USGS earthquake data. USGS Map – this view shows the map where the earthquake occurred. Here I will just show one of the view. Ignore the call to the controller (Ext.dispatch(…)) for now, wire the view when the controller is ready. We reached the last step and this is the point where all the action and view wired together. If you look back at the view, the handler dispatches specific action to the controller. The actions are defined in the methods below and the controller will then manage the page flow by activating the card. Switching page is done by calling the setActiveItem() and it is applicable because my Viewport is using card layout. If you are not using card layout then the controller will need to render the UI component. In the sample code below the view is rendered using the Ext.Controller render() and listener is added to catch the event bubble from the view. The screenshots below are the result from the above tutorial. 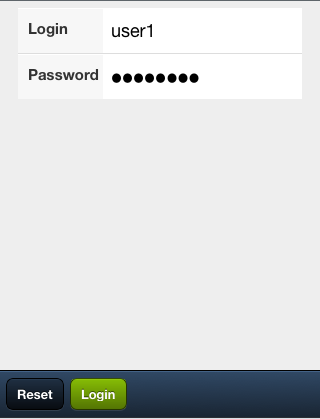 Implementing the structure and MVC into Sencha Touch definitely helps to simplify my design. I can easily implement the page flow and not end up with spaghetti code. It also helps to separate the view, data and controller and make the code more maintainable. Hope it is useful and happy hacking! 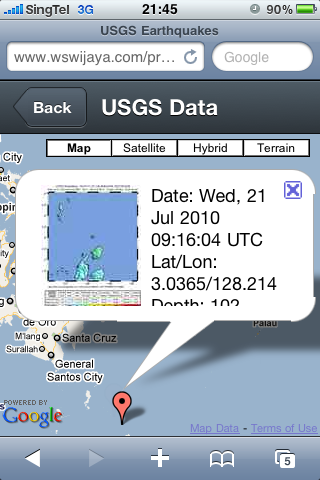 After developing the USGS earthquake for mobile, I want to extend it to display more information. One of the challenge I faced was how to dynamically load data into the nested list. I did a bit reading in the forum and someone suggested to implement the following. I did try out to use setList(), however I noticed a problem when I clicked the back button. The nested list still remember the original “items” which was set to blank or . It is correct that setList() will rebuild the entire list, however in this instance it is not the right method to use. One thing to highlight is the setList() is called when item is tapped and when we click back button, however everytime it is called the new list is appended to the end of the collection as shown in the code below. As we tap the item and click back, the index counter become wrong. 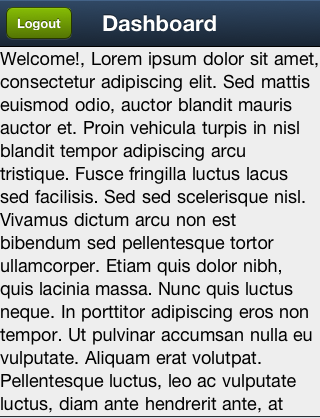 Dynamically load nested list after the UI is launched. Dynamically load list when item is tapped. The alternative solution to dynamically set the nested list is to extend the original object and implement a new method “reset” as shown below. Perform exactly as It is in setList() but instead of joining the list, reset it. This will address scenario 1. In order to address scenario 2, override the onItemTap() as shown below. In this example, I added a new attribute “fid” into the item which helps to decide what data to load. In your implementation you might call JSONP request to load the data. Note: For desktop, try on HTML5 ready browser. I used Chrome to test it out. Update: See the updated version implemented using MVC here. So , how is it done? // nbTweets - tweet list. Using Template to generate the html. // insert the code to add marker to map. So far, I have tested in iPhone Safari (on iOS4) and it works fine. Not sure how it performs in Android yet. One thing to note is the mobile browser must support HTML 5. 🙂 If you try the links below on Android, drop me a comment whether or not it works and what Android version you are using.